We all like holidays. Not only is it good to take a break from work, home, or the winter weather, but it’s good to give yourself a break from routine. However, what happens when you have been working out regularly for about 4 months and then take a month off from your exercise routine? You might be surprised to find out! Researchers in Queensland, Australia designed a 20-week study of men in their 70s to determine just that. Studies have shown for years the positive effects of resistance training on muscle strength and power. (Musclestrength is used when you try to lift a heavy box. Muscle power is when you run up a flight of stairs as fast as you can.) Numerous studies have also shown the positive effects of aerobic training on cardio-vascular fitness. But instead of resistance training, this study set out to determine if a particular type of aerobic exercise could also benefit thigh muscle strength and power. They used a cycle ergometer, which is an exercise bicycle where the resistance can be controlled. The scientists measured the fitness of 24 men in their 70s. Then the men were randomly assigned to one of two groups. The first group followed an aerobic exercise program of increasing intensity. The other group (the “control” group) did no formal exercise. The fitness of all 24 men was measured every four weeks, and then four weeks after the training program ended. In the first 8 weeks of training, the men in the exercise group showed no significant change in thigh strength. However by the end of 12 weeks, there was a significant increase and by the end of the training period their strength was up an average of 21%. Their thigh muscle power and aerobic capacity (how efficiently the body uses oxygen) increased continuously throughout the training. Plus, they lost fat and gained lean muscle mass in the thigh. As expected the control group showed no change, except for a slight decrease in muscle power — not surprising, since people in their 70s can lose 5% of their muscle power per year. But what happened to the men in the exercise group when they stopped exercising? After 4 weeks of no exercise, their thigh muscle strength decreased to the levels shown at week 8 of the exercise program. Their muscle power decreased the most, ending up even lower than at the start of the study. Body composition (proportion of fat and muscle) returned to pre-training levels. Aerobic capacity also went down, but still remained well above the pre-training levels even 4 weeks after exercise stopped. This was unexpected by the researchers. Whether you’re a man or a woman in your 70s, older or younger, this study shows that one type of aerobic exercise can provide a host of improvements to your strength, power, aerobic capacity, and body composition. But you have to keep at it — if you stop exercising for a month, you will lose most of your hard-earned gains. So, the message is keep your holidays from exercise short. Keep what you’ve gained after all that hard work. Use it or lose it! Sure, take a little break now and again but don’t wait too long before getting back on track! Lovell, D., Cuneo, R, and Gass, G. (2010). Can Aerobic Training Improve Muscle Strength and Power in Older Men? 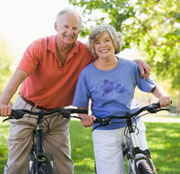 Journal of Aging and Physical Activity, 18, 14-26. Spriduso, W. (2005). Physical Dimensions of Aging. 2005. Champaign, IL: Human Kinetics. May we suggest you take a brisk walk while you wait for your prescription to be filled? What Will You (Still) Be Doing at 102? Working Out, I hope!